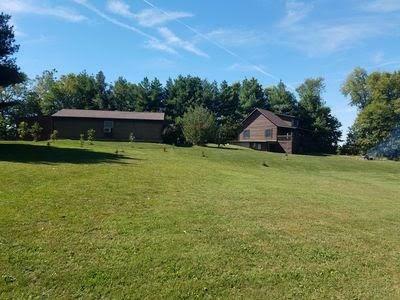 Beautiful 3 BR , 3 FBA Log Home on just shy of 2 Acres. Mature Trees adorn this beautiful property. The view from this huge front porch is just what you have been looking for. Sit a bit and have your morning coffee and reading time. This beautiful Log Home also has a fully functional Woodworking Shop with Heat and Air conditioning.Walk-out Basement with Office and Laundry Room. Energy Efficient Home with Geothermal heating and cooling. This Log Home has so much to offer!! Peacefulness in all its Beauty!! !